Everyone knows that Harbor Freight sells lots of crap stuff but they DO have a few gems worth buying. The $30 swingarm stand works great for the money. Be aware that the swingarm carriers on each side are coated in plasti-dip which tears the first time you use it (ridiculously bad design there). Use duct tape to hold the soft plastic together or just throw away the pasti-dip and use duct tape instead to avoid scratching the bottom of your swingarm. Harbor Freight also has an add-on part so you can use this as a fork stand. Now with my last bike I had Pit-Bull front and rear stands which together cost $500 and THIS is not THAT but for $30 I think it's a good value (even with the tear-away plasti-dip). Also, THESE gloves are nice, summer gloves for a fraction the price of "motorcycle" gloves. They're very comfortable with a padded and reinforced palm heel and they have rubber protection for your knuckles and fingers and, importantly, a velcro wrist closure to keep them on. Pretty much perfect for summer use in my opinion. Yeah there are some gems there. I like their wheel chocks. Easily bolted to a trailer. Also, adjustable for differing wheels sizes - they work for the Z125 too. And for those who use generators, the Predator 3200/4000 is actually pretty good. I'm in Canada but I made a special trip to Harbor Freight for their goodies. We have a similar kind of shop here as Princess Auto, but they carry slightly different stuff. Love them both. Will be duct-taping it before the next use. What's better is that I set the width for our Z125, and without any further adjustment it fits my wife's CB300F. I also bought two of these chains, it looks like a knock-off of the Oxford HD Mini which I also have. The price is right, and presents enough of a visual deterrent to casual thieves...I hope..! I got the Harbor freight stand, but mine didn't work well at all. I could live with the torn coating on the pads, but I think mine was somehow misaligned. Every time I used it to lift the bike the left pad would stay in place but the right one would slide forward. Also, when the bike was on the stand it didn't seem very secure. There was a fair amount movement whenever I worked on the bike. I have a Woodcraft rear stand and Pit Bull fork stand that I use on the other bike, but it has spools. I ended up putting the lifting pads from the Harbor freight stand onto an aluminum stand (also from Harbor Freight). It took quite a bit of modding to get it to work, but the end result is much less effort required to lift the bike, the rear wheel is only a couple inches off the ground, and it seems to support the bike more securely. Having said all that, If I didn't already have the other aluminum stand I would have just replaced the Harbor Freight stand with one of the Trackside models from Cycle Gear. If you want a decent stand, this is not it. Get a quality stand like a Pit Bull, the have the geometry figured out. I used to think, I'm not paying for a pitbull, but after using one, I now understand it. There are middle of the road stands like T-REX... best customer service I've come across in any genre of C.S. The price difference between a cheap stand and a pit bull is negligible after your bike falls off the cheap one I do like the Harbor Freight bike jacks though. I had my almost 600 lb Dyna on it for over a week while doing some service. Rock solid. If I were getting a high quality stand for the Z125, I'd choose a Woodcraft over the Pit Bull. The pit Bull is a great stand, and I think its inherently the strongest, but the Woodcraft is more than strong enough for any bike I know of and their current models are height adjustable. For example, on the MT-10, the lowest height setting on the Woodcraft has the rear tire just barely off the ground and makes it easy to do things like checking the oil level, while the medium height puts the bike in the same attitude as the pit bull. Lifting effort is also about the same as Pit Bull. The big advantage on the Z125 is that you could just keep the stand at the lowest height setting and not have that tiny rear wheel so high up that the bike looks like it's doing a stoppie when it's on the stand. The only reason I'm not using the Woodcraft on the Z is that I bought it for the Yamaha (so I got it with spool adapters instead of lifting pads) and I'm too cheap to buy the pads. I'm also too lazy to change from spool holders to pads and adjust the width to move it from one bike to the other. At any rate, that's just my personal opinion and YMMV. Bent my HF rear stand the first time I used it lifting up the rear of a Honda Magna. Went out and got a set of PitBull stands and they stand up to all kinds of abuse. I bought the HF rear spool stand, and for the little I need it for, it works great. Especially if you are just lifting the Z and not a full sized bike. I mainly just use it for chain maintenance but have left it on the stand for 3 days once and all has been well. Maybe I just got lucky. 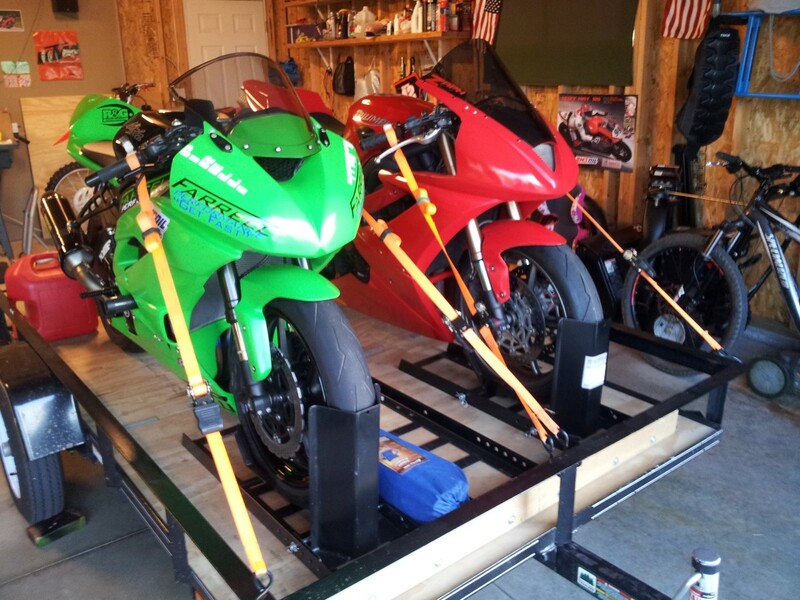 The short aluminum stand is OK, just don't put much side load on the bike while it is up (or it may fold and fall). It is definitely not a great stand, but it is doing the job I need right now until I make something different for my bike.